We pass the Corinth Canal to reach Mycenae, a "city rich in gold" with fascinating ruins, before finishing our excursion with a visit to the beautiful Castle of Palamidi, an architectural gem of the Peloponnese. Leaving the port of Piraeus behind us, we travel to Corinth where we make an unmissable stop to admire the spectacular Corinth Canal. The road passes directly over the canal, offering a spectacular panoramic view point; be ready to be amazed by this magnificent triumph of engineering! The canal is cut out of the rock, with cliffs that reach 79.5 metres at their highest point. We may be lucky enough to capture a photo of one of those rare moments when a ship is sailing beneath the viaduct as a train passes overhead. We continue on to Mycenae, described by Homer as the well-built Mycenae, rich in gold. Nestled in the foothills of Mount Zara and Mount Agios Ilias, the city surprises us with fascinating ruins that bear witness to the splendour of the past. We enter the archaeological site through the famous Lion Gate to visit the royal enclosure. The central section of tombs, discovered in 1874 by the archaeologist Heinrich Schliemann, contained the fabulous treasury of Agamemnon, now on display at the National Archaeological Museum in Athens. 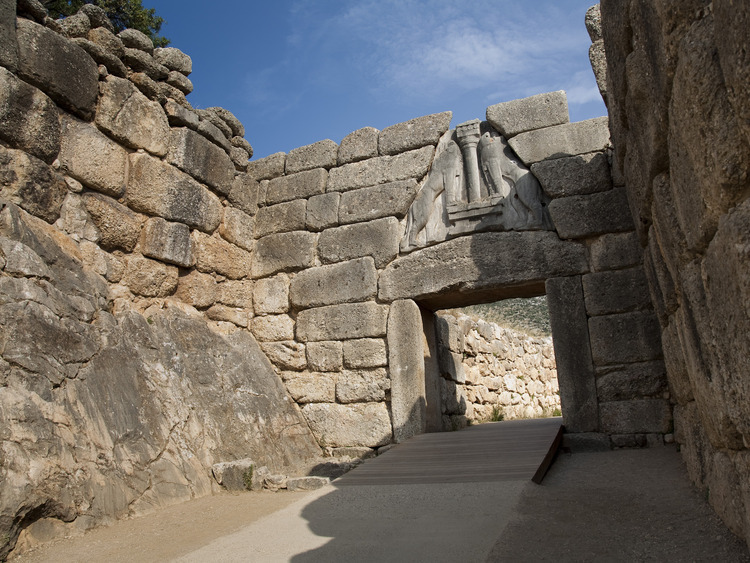 At the foot of the Acropolis of Mycenae, we visit the tombs of Agamemnon, Aegisthus and Clytemnestra. The largest and most sophisticated of the Tholos (Beehive) tombs discovered in the city is that of the king. It is also known as the Treasury of Atreus and has a 13 metre-high central burial chamber that emanates a sense of power and majesty. We leave this place that is so rich in history, art and meaning and return to reality, proceeding to Nafplio to visit the stunning Castle of Palamidi, which stands on a hill 216 metres above sea level to the east of Acronafplia, fortified by the Venetians during their second occupation of the area (1686-1715). This imposing Baroque fortress was designed by Giaxich and Lasalle. In 1715, it was captured by the Turks and remained under their control until 1822, when it was liberated by the Greeks. Before returning to the port, we enjoy a stroll through the stunning historic centre.